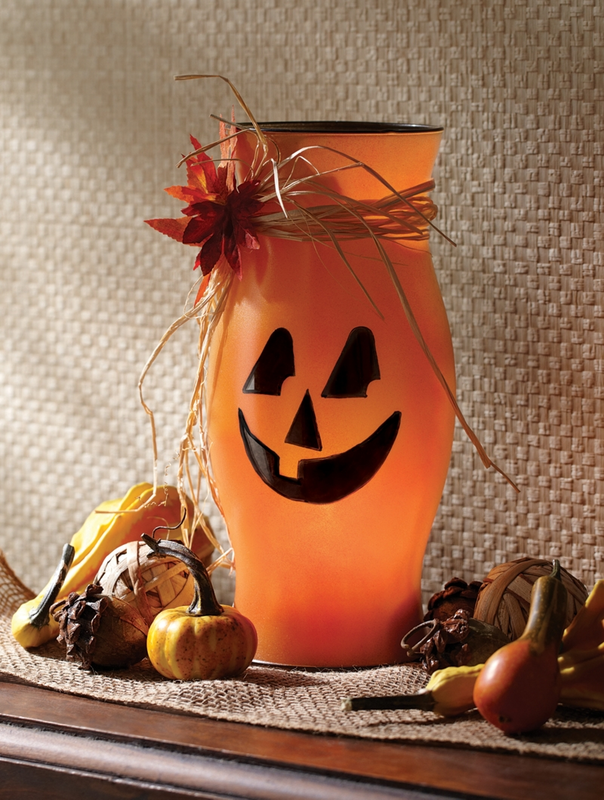 Brighten up your seasonal décor with this Halloween hurricane lantern using spray paint. Halloween Hurricane was designed by Roxi Phillips. Using craft scissors cut Jack-o-Lantern facial features out of adhesive backed vinyl; adhere to one side of glass hurricane. Spray outside of hurricane with Krylon® ColorMaster™ Paint in Pumpkin Orange. Remove vinyl masks before paint is dry, then allow to completely dry. In a sweeping motion, spray only the backside of hurricane (side opposite the face) with Krylon® ColorMaster™ Paint in Black; allow to dry. Using a Krylon® Short Cuts® Paint Pen in Black, outline facial features and top and bottom edges of hurricane. Tie several strands of raffia around top indentation of hurricane. Use hot glue to add silk leaves to raffia knot. Add LED light to inside of lantern. Note: use a lid from spray paint can to elevate light if needed.